The corporate networking group Movers & Shakers has always done things a little bit differently from other organizations, and on Friday the 5th of June they pulled out all the stops as they took over Mantra. Mantra is a very well known self-standing restaurant which forms part of the Amari Pattaya. Mantra has a unique bar and restaurant that houses many kitchens serving up cuisines from all over the world. However, to accommodate Movers & Shakers, the entire restaurant was cleared of tables and chairs to make way for a throng of networkers. 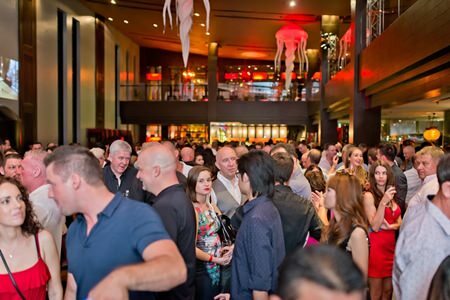 Always glitz & glamour at Movers & Shakers. On the night an estimated 300 guests attended, paying the 500 baht entry fee which included free flow beer, red & white wine and soft drinks. Although the tables and chairs were removed, Mantra still laid on an assortment of food, such as Japanese sushi and maki rolls, Chinese dim sum & Peking duck rolls, Mini Mantra burgers & Mediterranean shrimps, Indian butter chicken & naan bread, Olive Focaccia & mini pizzas, mini spinach cannelloni, and canapés including salmon rose, cream cheese, Asian meatball & deep fried prawns with horseradish sauce. The Riviera Group was the title-sponsor and their brand ambassador Metinee Kingpayome could be seen mingling with the guests. 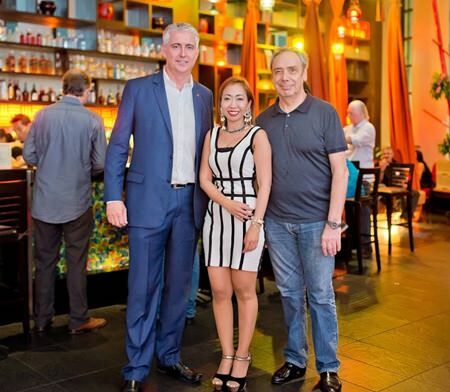 (L to R) Mantra Brendan GM Daly with Amy from Centara Grand Pratamnak and Peter Windgasse from the Mood Blues Cafe. Sub-sponsors were Cornerstone, Nelson Autohaus (BMW Thailand) and Defence International Security Services. The networking officially finished at 8:30 but the party continued with discounted drinks, a spectacular wave of musical entertainment, and stage shows. (L to R) M&S Founder Cees Cuijpers with Riviera Brand Ambassador Metinee Kingpayome and her husband Ed Sharples. Mantra completely transformed for Movers & Shakers. Marcus Goehrt seems to be enjoying the networking.